Combine the water and salt in a 3-quart or larger saucepan and bring to a boil. Add the corn grits slowly while whisking continuously. Whisk for 1 to 2 minutes to prevent the mixture from lumping. Lower the heat, cover, and cook on the lowest setting for about 40 minutes, stirring often. Use caution when removing the lid and stirring, as hot polenta can bubble up and splatter. If the polenta gets too thick, add a little more water or broth. If the liquid is heated before it is added, the polenta will cook faster (cold liquids will lower the polenta’s temperature and extend the cooking time). 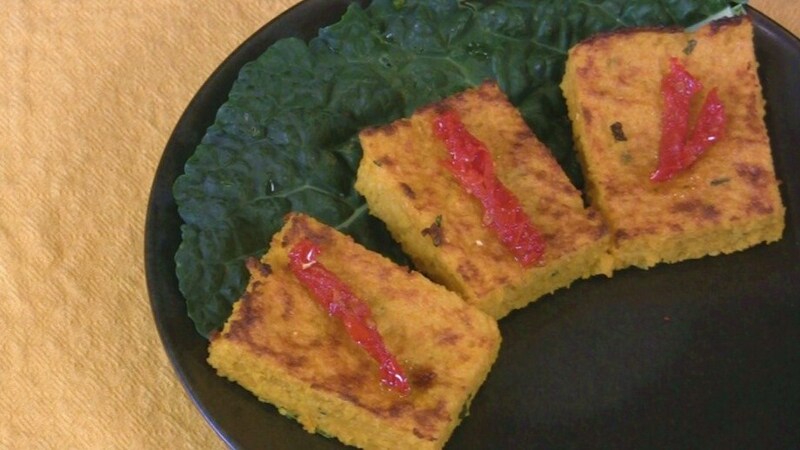 The polenta is ready when it is smooth and thick and the grains are tender. Toward the end of the cooking time, whisk in the nutritional yeast and optional garlic and herbs. Add more salt if needed. Serve soft-style, straight from the saucepan. Alternatively, spread the polenta in a 9 x 13-inch baking dish or sheet pan and allow it to cool. -- about 20 minutes Cooled polenta can be sliced, brushed with a little olive oil, and then baked in the oven or placed under a broiler until crispy. Stored in a covered container in the refrigerator, leftover Basic Polenta will keep for up to 4 days. When reheating soft-style polenta, thin it by whisking in a little vegetable broth or water. Add more nutritional yeast for a "cheesier" taste.